As nativism, xenophobia, vile racism, and assaults on the rule of law threaten the very fabric of our nation, The Corrosion of Conservatism presents an urgent defense of American democracy. Pronouncing Mexican immigrants to be "rapists," Donald Trump announced his 2015 presidential bid, causing Max Boot to think he was watching a dystopian science-fiction movie. The respected conservative historian couldn't fathom that the party of Lincoln, Roosevelt, and Reagan could endorse such an unqualified reality-TV star. Yet the Twilight Zone episode that Boot believed he was watching created an ideological dislocation so shattering that Boot's transformation from Republican foreign policy adviser to celebrated anti-Trump columnist becomes the dramatic story of The Corrosion of Conservatism. No longer a Republican, but also not a Democrat, Boot here records his ideological journey from a "movement" conservative to a man without a party, beginning with his political coming-of-age as a young migr from the Soviet Union, enthralled with the National Review and the conservative intellectual tradition of Russell Kirk and F. A. Hayek. 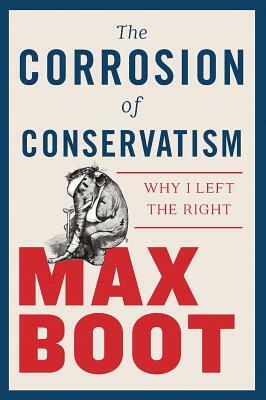 Against this personal odyssey, Boot simultaneously traces the evolution of modern American conservatism, jump-started by Barry Goldwater's canonical The Conscience of a Conservative, to the rise of Trumpism and its gradual corrosion of what was once the Republican Party. While 90 percent of his fellow Republicans became political "toadies" in the aftermath of the 2016 election, Boot stood his ground, enduring the vitriol of his erstwhile conservative colleagues, trolled on Twitter by a white supremacist who depicted his "execution" in a gas chamber by a smiling, Nazi-clad Trump. And yet, Boot nevertheless remains a villain to some partisan circles for his enduring commitment to conservative fiscal and national security principles. It is from this isolated position, then, that Boot launches this bold declaration of dissent and its urgent plea for true, bipartisan cooperation. With uncompromising insights, The Corrosion of Conservatism evokes both a president who has traduced every norm and the rise of a nascent centrist movement to counter Trump's assault on democracy.